Welcome to Retropolis, home of the Mechtorians, a society of retrobotic characters from all walks of life. Brass moustachioed scientists rub copper-plated elbows with polished metal bank managers, fairground hawkers and socialites in a fantastical realm where humans play no part. A world whose inhabitants go robotically about their daily routine, playing out their part in a society modeled on a flimsy memory of an ideal world. Every tone and level of life is here. From the extraordinary to the mundane. Each character has their own story and each story illuminates a small part in the wider tale of the Mechtorians. 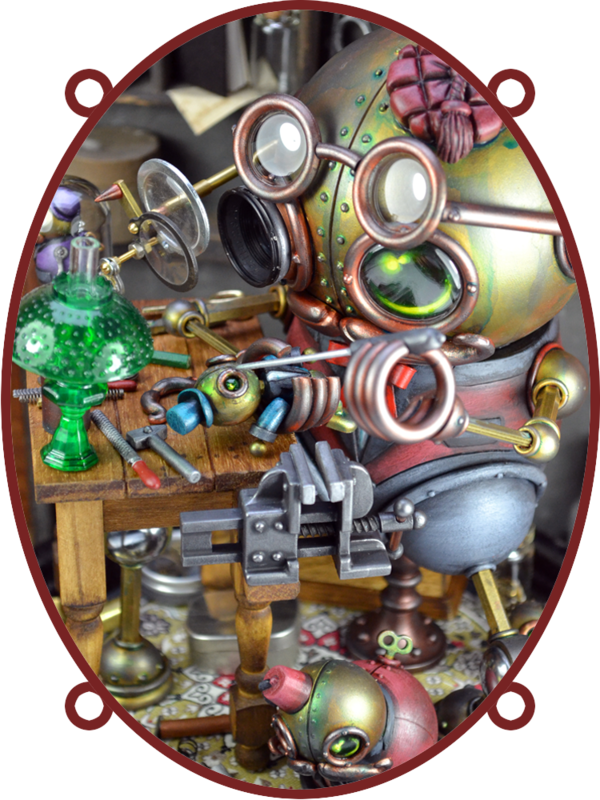 Created by English artist Doktor A. the Mechtorians are an ongoing creative project spanning many mediums and formats. Collected here for the first time are the majority of works produced over the last decade. Sculptural pieces, drawings, paintings, small run toys and other items are all represented in the ever growing world of Retropolis. To find your way around the many sections of the world please use the menu above. Or simply jump right in. A good place to start may be HERE.